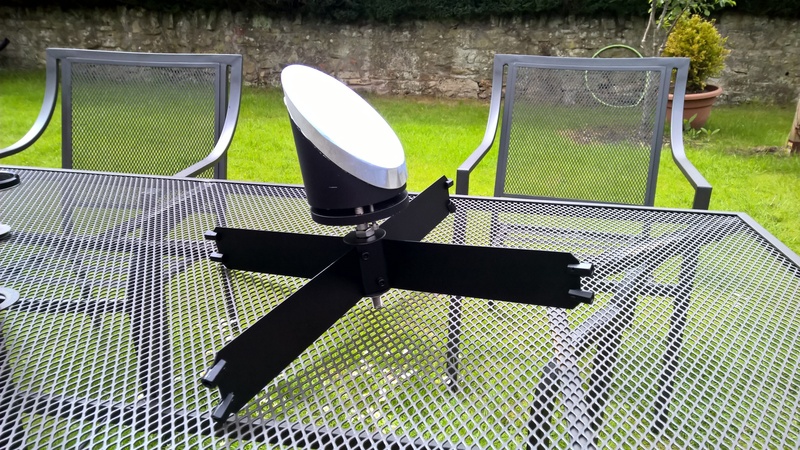 Some of you may remember the thread back in August of last year in which Andrew S very generously donated a 16 inch mirror together with mirror cell (a lot of other associated astro gear). Well it seems so long since I met Andrew in the Lake District in October but I've eventually found some quiet time in the school calendar and we are making progress on our build. 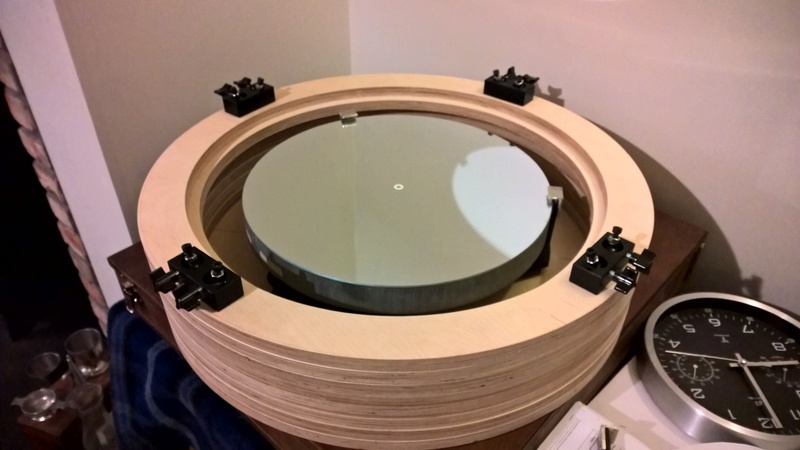 I hesitated for quite some time on the design, I wanted to do justice to Andrew's donation, and so I eventually settled on a circular mirror box design. Our inspiration comes from http://www.waiteresearch.com/ . 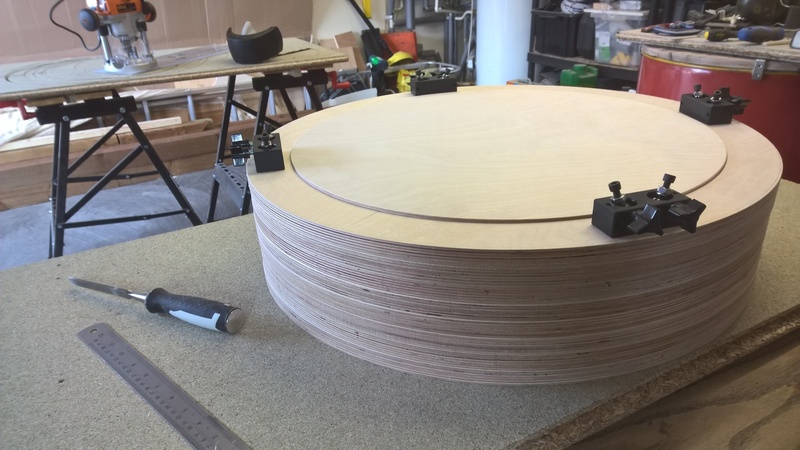 Mirror box is largely done and fitted with its mirror cell, now waiting to be glued together and sanded. The photograph below shows a trial fitt with the mirror in its cell. We also have the OTA assembled and waiting to be fitted up with the secondary. I had a go at making the secondary over the weekend but my welding skills fell somewhat short against how I had remembered them I now have a second spider design to be trialled this weekend. I'm keen now to get the kids involved before we spilt up for the summer holidays so the plan is to attach the mirror box to the OTA in school next week - we already have the truss tubes waiting to attach to the Moonlite sockets. Our task is to experiment finding the correct length required for the truss tube before cutting them to size - this will be a good challenge for my S3 class and fits in well with work they have done to date. 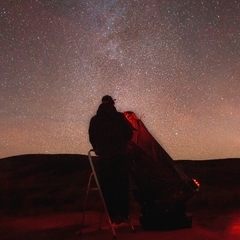 The aim is to get everything ready for our return to school in Aug and then a proper shake down at a nearby dark sky site from October onward. I'll post updates as they happen, but please be patient - we are making a few mistakes as we go along Andrew, once again, a massive thanks. Well done SAAC, really looking forward to seeing the finished scope. Well done on getting the kids involved! Nice project and well done getting this far. Must say that it's nice round although not the most inefficient way to use ply as there is a lot of waste. A torch can be used to roughly determine the focal length of the scope or a focault/ronchi test. Looks great Jim very nice work. Thanks Damian, I'd love to say that it was the result of one take but it took a few goes to get it right. This type of thing can be really frustrating but hugely satisfying at the same time. I have my fingers crossed that it will hold the secondary secure and stable enough; it is a large secondary. I used 1 mm thick mild steel but in the back of my mind I'm open to the need to revisit it with a thicker gauge; I'll see how this one works first. Jim, I don't think the gauge will be an issue if you can get a high tension in the spider vane (hope the welds hold). An additional option is to counterbalance the weight of the mirror and holder to remove the torque. What is the secondary size Jim? I had 3 attempts at the spider until I was happy with it. I used 1.5mm thick material in the end but my secondary is 130mm MA and weighs .7kg. Hi Damian, the secondary is 125mm on the MA and, together with holder, comes in at just over 1kg. I've no real worry about the spider holding the static load of the combination; I'm just hoping that it will not flex overly making retaining collimation problematic. I think as Andrew suggested, I'll have a better feel for how it will perform once installed and under tension. I've never used this type of telescope before, would I be right in thinking that it would need to be collimated each time it assembled anyway. How well do you find they hold alignment during use? They hold collimation really well if accurately designed and built to be assembled time and again with just the minimum of tweaks. I probably adjust mine 1-2mm max which is easy to do. 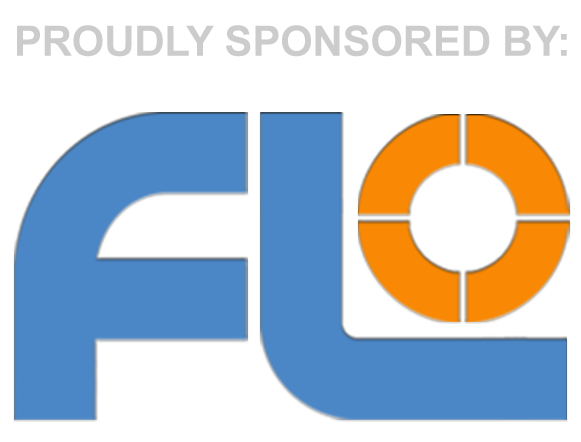 Preventing flex can be difficult but not impossible. Rotational forces on the secondary can be an issue, too much tension can distort the U T A so caution should be observed when strumming on the vanes to test the tension. Your build is looking great so far, I shall be folliwing closely as I'm looking to do a similar build in the not too distant future. Can I ask what you did to connect the theaded connectors to the end of the vanes? 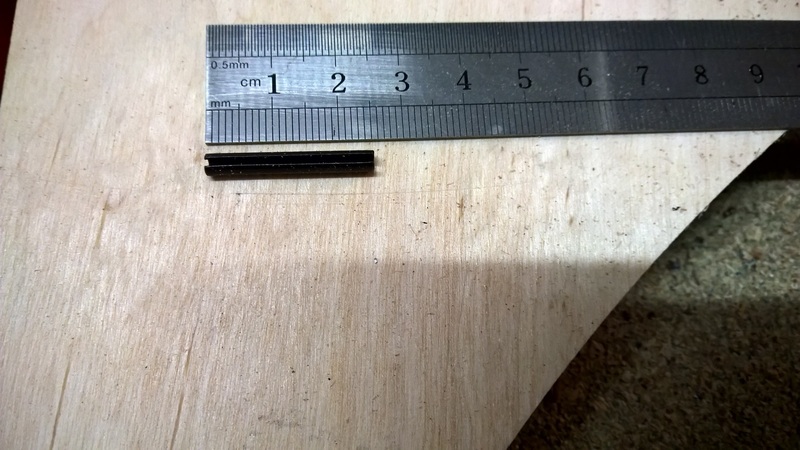 I can see that you've used threaded rod couplers and have drilled through them, and cut a slot into them to accept the vanes, but what did you use to fix them in place? 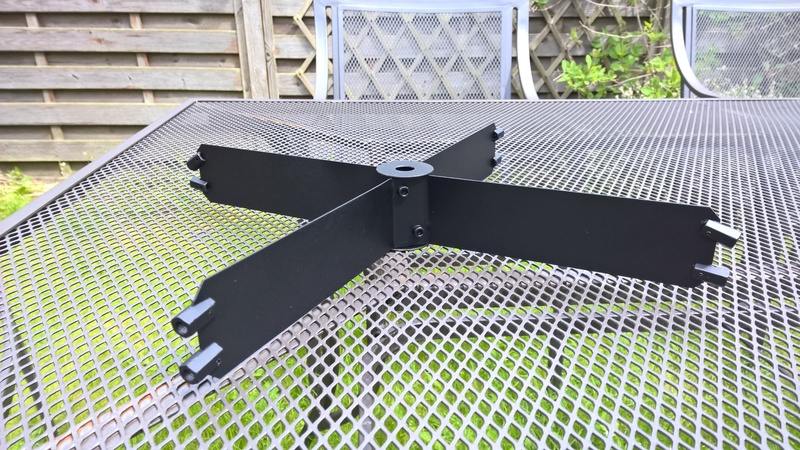 I'm currently trying to make a more secure attachment for the spider on a 12" DarkStar Dob that I'm restoring I have the threaded rod couplings but can't work out how to secure them to the vanes of the spider. Looking at my Skywatcher OTA it appears that they have used small diameter split tubes inserted into the holes but I don't know what these are called or where to get any from. Is that the sort of thing that you've used? As I'm a real novice, any help would be appreciated. I think it is something like this. But I'd use a threaded rod instead, so fastening can be done with 2 nuts/washers for each vane. And there is absolutely no need to use two rods for each vane Jim. Looking at my Skywatcher OTA it appears that they have used small diameter split tubes inserted into the holes but I don't know what these are called or where to get any from. Try searching for "roll pins". Excellent, thanks @jacksdad that's exactly what I was looking for. I knew someone out there would know the proper name for them. So @Chriske have I got it right that you'd replace the parts you've drawn above with threaded bar and use nuts inside and outside the tube? @saac apologies, I didn't mean to hijack the thread, I just wanted to know what the parts were called. Ade, sorry it's been a while since I'd logged on and I've just spotted your message. Firstly, thanks for your comments and good luck when you get around to doing your build; great fun and frustration in equal amounts As jacksdad commented, the threaded connectors are attached to the vane using roll pins. 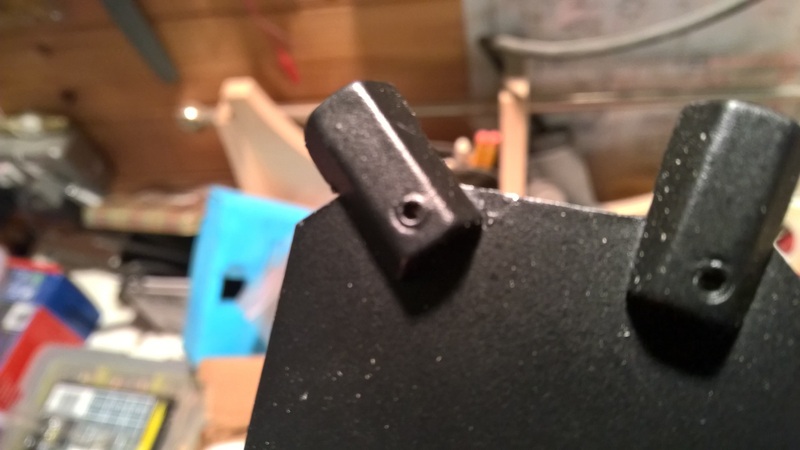 The hex connectors are first slotted - I used a hack saw, perhaps a Dremmel cutting disc would be quicker and neater. The connectors were then drilled to accept the pin which was then trimmed and peened once inserted in the vane. 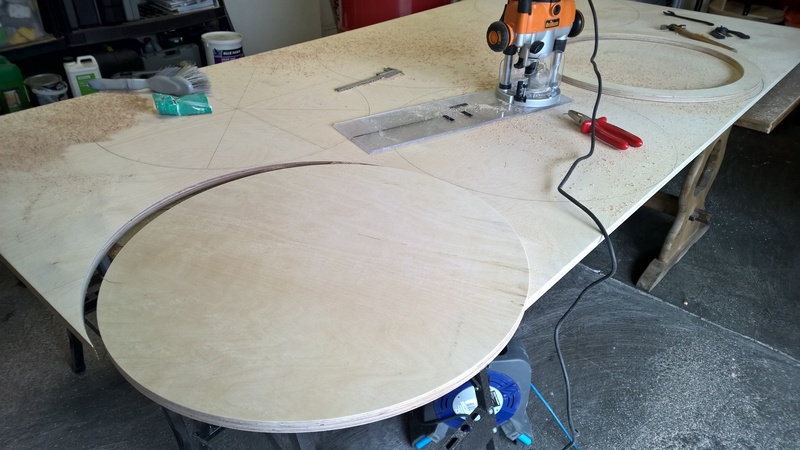 Useful if you have a drill press to help keep everything square. I sourced a selection of mixed size roll pins from Amazon, fairly easy to come by but if you have any trouble let me know, I have a fair few left over. I made a wee bit of progress on the upper OTA over the weekend. I cut the tenon and mortise joints for the vertical supports (spider supports) together with the focuser board. These are now installed and will be glued up in due course. I also had a trial fitt of the spider itself and all looks good; I need to order some more fasteners and install the focuser and that should be upper OTA finished. I'll post some photographs in due course but this is a busy week at work and at home so may take a wee while. Ade, don't know if these may help (sorry for the focus). Roll pins are split along their length as seen in the second photograph, the hole is drilled undersized and the pin drifted in under under compression; it's held in place under an interference fit. I can see two potential problems with the mounting of your secondary mirror. The gap between the mirror and holder is very small and will make removing it difficult when you need to do so to re-coat it. In the picture it appears that the bonding agent is up to the edge of the mirror. This is bad practice as it can cause deformation of the mirror giving astigmatic views. The secondary should be mounted in a similar fashion to the main mirror. You can use one central blob of silicone no more than 25% the diameter of the mirror. If you prefer you can use three blobs but much smaller than a single blob positioned at about the 50% ( between 40-70%) zone . There should be about 3mm gap to allow the safe and easy removal of the mirror from the holder. Otherwise the build is looking good. Indeed, in a situation like this I'd use threaded rods, Make a slit with a hacksaw or a dremel(grindingdisk) and you're done. That slit doesn't have to be very deep at all. I would make the slit just wide enough to allow the spider to fit in without any play. To prevent these parts from moving I use a small bolt instead of a pin. Tightening that bolt will secure it all in place. So a (M6) 1/4" bolt or threaded rod would do fine in this case. 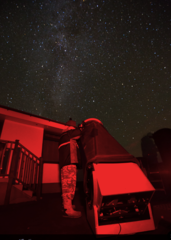 Not only will it be difficult to remove that mirror, but cooling the mirror before observing would go a lot faster if there is a gap between mirror and holder. Astigmatic error will be an issue imo. I've done lots of repairs in the past, lots of these secondaries were glued like yours and suffered from that problem. I would do what Nigel suggested using silicone-blobs. Don't blame Jim for the mirror attachment he got it like that. The secondary holder is hollow if I recall correctly so you would have to remove the mirror and add a solid layer to bond it to in the manner proposed. In the past when I researched this area I found a wide range of "best" options all quite different. I have made 5 or 6 Newtonian telescopes with the secondary attached this way without any cool down or optical issues. I would try it as is before fixing a possible problem. I have always found a thin sharp blade .e.g. a craft knife cut the mirror from the holder without any problems. PS I should have said I used 3 arcs of silicone with gaps between them. When siliconeing a secondary I place 3 coins between the secondary and the holder face to make sure the secondary is fixed without tilt. The coins are removed once the silicone has set. I used thin steel rod rather than coins but the principle was the same. When removed they created the gaps!